For many of us, selecting the right international schools for our children is, after choosing where to live, the most important decision we have to make when moving to a new country. There’s a wide choice of international schools in Singapore, most of which offer a multicultural environment, with students from a diverse range of backgrounds and countries. Add to this a wide variety of curriculums, from single-country programmes to the International Baccalaureate and International Primary Curriculum, and there’s not much more that a parent could wish for. While a visit to a school is often the best way to make an instinctive decision based on the individual needs of your children, hearing the opinions of other families about their experiences can be invaluable. The following guide is not just a list of international schools in Singapore, it features a multitude of referrals from Expat Living readers to help you decide on a school, or slim down the list of schools you will visit. There’s also a map at the end of the article to show you the locations of these top international schools across town. If you’re still considering where to live in Singapore, your options are wide open! “We’ve lived in Singapore since June 2016 and all three of our children are attending GEMS (Singapore). The school is a tremendous asset to the community and is always supportive of our family and our children’s goals and aspirations. This is our family’s first experience with the IB curriculum, and we’re pleased with the delivery of the programme and the smoothness in which our children transitioned. The teachers continually impress upon the students to engage and appreciate diversity and community. The student body is rich with culture and the school provides well-rounded lessons and assignments that encourage the children to think independently. We’re especially pleased with the at-home assignments, which are relevant and in line with the children’s exploration topic for the quarter. The students are given the opportunity to personally choose the projects they complete; this increases the desire to research and complete the task because of the ownership instilled. GEMS (Singapore) was highly recommended by a neighbourhood friend who raved about the faculty, curriculum, facilities, extracurricular activities and their children’s positive experiences. Due to the glowing reviews, we couldn’t pass up the opportunity to visit the campus and learn more. The school hours are fabulous. “We’ve been living here for almost four years now. Kira and Isabel have been attending SAIS since we moved here and it’s been a great experience. They are enjoying the campus with multiple swimming pools, the theatre, athletic field, several libraries, indoor arenas, classrooms, cafeterias and of course, the Innovation Center. Both kids are also involved in CCAs such as sports, theatre productions, choir, music ensembles and the language programmes. They’re also taking advantage of living here and learning Mandarin. Both girls are very involved in the school community – like their mom. I (Nicole) currently hold a PTA board position. The PTA is what keeps this community thriving and we have the most dedicated volunteers I’ve ever met! Kira and Isabel help out with the Halloween, Christmas and International Fiesta activities at school. When you attend these events and see the smiles on everyone’s faces, you can’t help feel that you’ve made the right choice! The kids have also greatly benefited from the wonderful staff and faculty with vast multicultural backgrounds. This could be one of the best highlights for our family, meeting people from all over the world. “The children have been attending AIS since we arrived in Singapore almost two years ago, and they’re thriving. They grew up in Switzerland, attending a local school in Zurich. The Heads of School, Heads of Year and the teachers are extremely committed, caring and passionate about educating children. They have got to know each of our children as individuals, which has been a key part in them adapting to their new environment, enhanced by the welcoming AIS community. The Admissions Team took time to understand the background, interests and specific needs of each of our children, so we knew we found the right school! AIS has an outstanding academic record combined with an extensive range of sports, creative arts, design and technology, languages (Mandarin and European), music and drama programmes. The CCA programme has something to suit everyone’s interests, from novice to expert. Willow and Brook recently attended AIS’s inspirational Outdoor Education Programme (specifically tailored to each year group and part of the curriculum). They absolutely loved each day, experiencing whitewater rafting, overnight camping and cooking, just to name a few. It helped them to build their resilience, selfc onfidence and ability to work with other students. “Both children have been at CIS since January 2014. As they had previously completed their entire schooling at an Ontario curriculum school in Hong Kong, emotionally and academically transitioning to a new school and country was quite difficult for them. CIS’s pastoral care supported them extensively during this transition; the advisory teachers worked with us to provide a good support system for our kids. The staff at CIS are approachable, and students are encouraged to communicate academic or social concerns with their teachers. The emphasis on the holistic wellbeing of students is also great – they’re not confined to book knowledge or traditional classrooms. My daughter has enjoyed being exposed to Model United Nations (MUN) and environmentalism through the Green Machine programme. Both children have also developed leadership qualities through their student council experience. My daughter serves as the President and my son is the Grade 7 representative. CIS aims at developing character with an emphasis on real-world exposure, such as the community and service work during excursions, interaction with other students during MUN, sports matches and field trips. The highlight of the school year for us is the UN food fair and parade. “Both our children started at Chatsworth in March 2017, and they love going to school every day. They’re encouraged to research, investigate and experiment in their learning. Reading, writing and maths are embedded into their units of enquiry as well as standalone lessons. Their love of reading has increased since starting at the school – DEAR (Drop Everything and Read) time is Toby’s absolute favourite. If you go into school at DEAR time, you’ll see everyone deep in a book! The open-door policy enables parents to visit the school at any time and help out in class. There’s also an excellent range of CCAs and ECAs offered, from sport and science to performing arts and coding, plus everything in between. We started with an internet search in preparation for our exploratory visit. After thorough research, we decided on an IB curriculum because we liked the ethos and wanted a curriculum that is easily transferable if we were to move in the future. During our first visit, it was clear to see that Chatsworth was different; there was a family-friendly and supportive atmosphere, and I felt an immediate emotional connection. “Both children have been attending Dover Court since they started in Reception at the age of five. It’s a medium-sized international school and that size brings a lot of pluses. Our children are given a lot of individual attention, and encouraged to have self-belief and be ambitious in the classroom and on the sports field. We like the English National Curriculum with an international focus that the primary school offers. In secondary, the students study for the IGCSE, while the school’s Sixth Form teaches the IB Diploma. Our children could end up living anywhere in the world, so a global element to the curriculum was important to us, including learning languages. As the school is part of the Nord Anglia group of schools, it has a teacher university programme ensuring teachers are up to date with teaching practices. Children also have access to the Global Campus where they can share ideas and experiences with children from other Nord Anglia schools around the world. “Both our children have been attending Dulwich since September 2016. Maia has developed in confidence and her grades have improved dramatically; she also speaks highly of her teachers. We are particularly impressed with the drama department; the standards of their productions are consistently high. Emil is a professional actor so he tends to be more critical than me, but even he had nothing but admiration and praise for the different productions. The school is committed to developing students who are passionate and proactive about making a positive difference to the world. Maia and Silas have become more aware of global issues and happily take part in a range of community service activities, such as helping out at Wishing Hearts. Maia is involved in organising a photo exhibition to help raise money for the sister school that Dulwich supports in Cambodia. Silas has had a terrific time in Juniors. His teacher taught him how to save and invest money; if only I’d learnt this at 10 – I’d be retired by now! Silas flourishes in sports, and has been offered numerous opportunities to compete in football, rugby, swimming and more. He has also discovered a love of art, and he went from being a non-Mandarin speaker to Mandarin Ambassador in a year. “Both children have been attending 5 Steps since last year. Our experience with the school has been very positive. The teachers are open to feedback and suggestions, and the classes are small, encouraging the children to be more engaged with the class and allowing teachers to observe each child’s academics as well as behaviour. The subjects are taught intensively, which explains how fast the students progress. Both our children are thriving and learning beyond their school grades. The school also offers extracurricular activities such as karate, music, art and chess, which our children enjoy. We also love the fact that the school cares about values and character as much as academics. 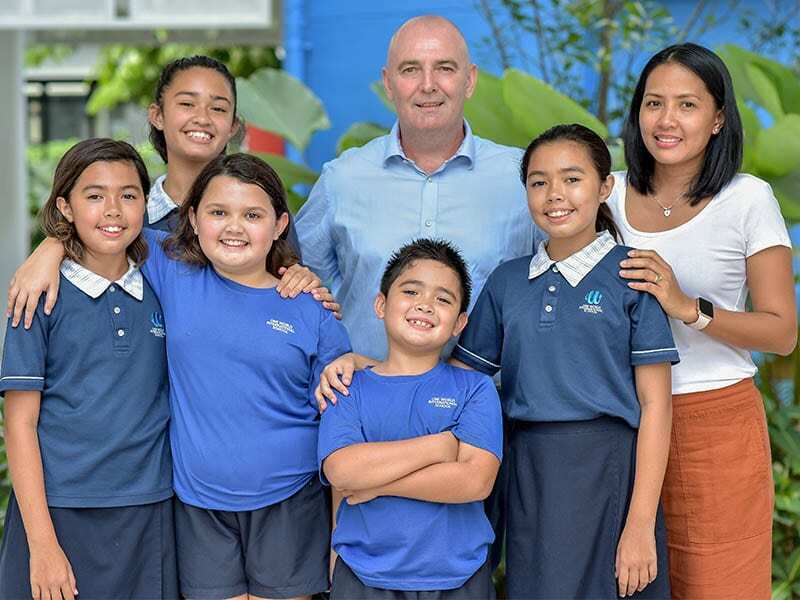 “Both children have been attending GESS since we arrived in Singapore in 2009. When we first moved here, the boys joined the Junior School Campus, which was small with a sense of community. The teachers knew the children and vice versa. We’re big fans of the IB and of enquirybased learning and we feel that GESS incorporates these well. We liked that the school is bilingual and has a German section running parallel to the IB section. Both boys were able to start learning German for around five hours a week. Having so much of the school life around them conducted in both English and German has helped them enormously. The school has a great range of after-school activities and numerous opportunities to get involved. Alex is currently Student President and just returned from a trip for MUN (Model United Nations) in Athens, while Finn is looking forward to an Operation Wallacea trip next year. Teachers encourage students to do more and make the most of the opportunities of living and learning in Singapore. “Both of our children have been at GIIS East Coast Campus since the time we arrived here in 2013. The kids started off in Kindergarten and have always enjoyed going to school. We’re very happy with the manner in which the school is run; the teachers have been wonderful, showing great attitude and effort. The school also offers a lot of options for the elective CCAs. Over the years, Zreh has taken up Maths Club, Aviation Club and Explorer Club, while Ava has been involved in Art & Craft, Bharat Natyam (Indian dance) and Jewelry Making. Zreh is also part of the school basketball team and represents the school in inter-school tournaments. The school has great PE coaches who get the children to enjoy and learn a variety of activities. GIIS has 4 locations island-wide. “Our younger son Rees began attending IIS in October 2017. I home-schooled both our boys for two years prior to enrolling them in their current schools. Rees has had problems learning effectively in a mainstream school setting, resulting in a loss of confidence and a dislike for school in general. In the short time he has been at IIS, we’ve seen remarkable improvement in his writing and communication skills, and his interaction with peers and adults. Most importantly, he is learning to like school again. We credit the exceptional teachers, patient and knowledgeable administrators and the atmosphere of kindness and care that is fostered at IIS. The students get lots of outdoor time and the low student-to-teacher ratio is a big plus. It ensures greater individual attention and allows for curriculum adjustments. “Our daughter Sasithon (Sasi) is currently in 7th grade at ISS. The school stood out among the others we looked into; some of the words used to describe it were “multicultural” and “nurturing”. When Ta and I met the school administration, we mentioned Sasi’s lack of English and were assured that ISS was well prepared for students who have English as their second language. By the end of K2, her first year at ISS, she was already using English as her primary language! At ISS, class sizes are small. By middle school, the curriculum is project-oriented, often crossing disciplines. For instance, design and mathematics learning might jointly see them working on building a model of a shophouse, while for humanities and language arts, they’ll look at Greek history and mythology. For maths, they had to design their own yards, including gardens, paths and pools with decks, gazebos and fences. The school also starts the kids on overnight trips from second grade. That year, Sasi’s class spent the night in the aquarium with fish swimming above them; the following year, it was two nights at the zoo! This past autumn, the 7th and 8th graders had the choice of day trips to places of interest in Singapore, a camp in Indonesia or a service trip to Cambodia. I’m proud that Sasi chose the trip to Cambodia to work with children in a shelter. They also had the chance to visit some places of interest in Phnom Penh. “My husband and I plan on returning to the UK for our children’s university education so we were keen for them to study under a British educational system. When Marlborough College opened its doors in 2013, we were curious to explore it. We took the plunge and sent Martha to board in Year 9 while we were living in Kuala Lumpur. She bravely tested the waters and luckily for her, and for us, she loved it! In 2015, we moved to JB, and since then our three children have been day students. Martha benefited from the boarding experience; her self-confidence and independence grew in leaps and bounds within just one short year. “We moved to Singapore in August 2016 and our oldest son Nuholt has been attending the school ever since. Nuholt is very happy at MSIS and that is the most important thing to us. The premises are very well kept. The children are given the opportunity to participate in various activities like swimming, gym and cooking, and there are additional services on offer such as physiotherapy, speech therapy and occupational therapy, if families require them. Different sports are also arranged as extra-curricular activities, according to demand. MSIS understands the importance of teaching daily living skills and this is a big part of the curriculum. The kids regularly go on outings that teach them these important skills, such as bus rides, visits to food markets where they purchase their own food, learning to work with money, going to the movies, and trips to the Singapore Botanical Gardens or the library. “All three children have been attending Nexus since we moved to Singapore in April 2014. The experience at the school has been nothing short of amazing. We’ve had four years of one outstanding teacher after another. There’s a wide array of activity choice, from sports to music and drama. Our children have been very involved in a myriad of activities from the beginning. They love Track & Field Day and competing for their house. As parents, the highlights for us are twofold: firstly, the parents and faculty that comprise the Nexus community; also, the exposure to a diversity of cultures in day-to-day friendships as well as the curriculum. The highlight for the children would have to be overseas trips. Our older two have also travelled internationally for swimming competitions. Nexus was one of the schools we planned to visit on moving here. We came across the website while living in the US and really liked their philosophy. One visit to the school and we knew this was the school for our kids. The school walked the talk when it came to their core values and celebration of diversity. Education extends well beyond the classroom and we love the holistic approach. We believe in the philosophy of the IB programme and have seen the results in our children. The IB and Nexus’s way of tying it all together is brilliant – it provides students with a strong skill set to be successful in life. As parents, you know your children and what they need in a school; do your homework and find one that works for your family”. “All our children have attended OWIS since January 2018. The admissions team is very easy to communicate with and down to earth. In class, teachers use technology such as iPads and Apple TV to conduct lessons. I would recommend the school to other families who are looking for innovative teaching methods and the use of technology, integrating children with the gadget-driven world of today. The school also offers the IB PYP (Primary Years Programme) that focuses on the development of the whole child as an inquirer, both in the classroom and in the outside world. Students hone various skills, growing into more competent individuals and team members. For example, a student who has weaker aptitude as a leader would be asked to head a team in order to develop leadership skills. The exposure to multicultural international students is also very beneficial to our children. It creates greater acceptance, understanding and empathy. We first checked out websites for most of the international schools in Singapore and visited five of them before choosing Overseas Family School (OFS). We liked the opportunity for our kids to have their mother tongue integrated into the school day. We were also impressed by the Study Preparation Program that is specifically designed for students whose first language is not English. Students are immersed in English on a daily basis to develop listening, speaking, reading and writing skills in all subject areas, with full integration into mainstream classes as the end goal. We also had a good first impression when we visited the school. We were shown around, introduced to principals and teachers, and felt very welcome. From day one, we felt our kids were in good hands. We got the support we needed, especially in the beginning when we had just arrived. Our youngest needed a little extra care and attention to make things work, and she received it. We find the learning environment at OFS very positive and giving. The balance between discipline and caregiving is very good. The academic level is high, but the kids are being taught in an inspiring and active way so it’s not just rote learning. The kids are given opportunities to perform and achieve success and they are recognised for their hard work. It’s hard for children and families to start a new life in another country a long way from home, especially when they don’t understand or speak the language. It can be exhausting but the teachers are working hard, both academically and with social skills in the classrooms. “We moved to Singapore from Tokyo and both of our kids have been attending SAS since that time. The school provides our kids with cultural diversity in a system with a holistic view on education and a great emphasis on values that will help them to not only succeed academically, but also in life. They try new things, explore their interests and present their thoughts. It’s an American school where more than half of the kids are American, but you’ll find a surprising richness in backgrounds. There is a good balance between academic performance and having fun. Our kids love that the school provides more than 90 after-school activities! “All our children have attended or currently attend SMMIS. Now only the younger three kids are at the school. The school has a strong curriculum, individualised attention, strong language training (in Hebrew and Chinese), and a solid swimming programme. However, what makes the school unique for us is the warmth of the teachers, faculty and administrators. The children are greeted each day with hugs by their teachers, and as parents we see the confidence that the children have developed because of the love that all the faculty show towards the students. One of our children has speech dyspraxia, and SMMIS provided him with daily on-site speech therapy and attention to help him overcome this difficulty. The dedication of the staff is truly exceptional. “Both children attend SJII; Gina is in Grade 7 and Jude is in Grade 4. They’ve both been in school since Prep 1. SJII is a happy place – you can see that in the faces of the children, teachers and staff that greet you every day. The school’s relatively small size (1,600 students) means the children get to know each other and their teachers quickly. SJII follows the IPC/IB curriculum, which at its core is aimed at fostering a life-long love of learning and curiosity. The teachers encourage the children to do the best they can and this supportive environment helps them flourish. Children are able to develop their skills, talents and interests, while achieving good academic results. What makes SJII special for our family is their focus on service and the virtues programme. Students have ample opportunities to help the less fortunate, care for the community, develop leadership and other key life skills. The virtues – 52 in total, one for every week of the year! – become a moral compass for them. “We arrived in Singapore in September 2010 and all three children are at TTS – we have one in each school! We’ve loved TTS from day one. The school community of teachers, parents and children is very welcoming and supportive. Our children love going to school and have made some great friends there – as have we. The teachers are encouraging and have helped our children to develop into independent and confident thinkers. They go the extra mile to get the most out of the children and to give them a fantastic experience. The school also has exciting overseas school trips, “Wow” Days that are used to introduce new curriculum topics, and a huge range of CCAs. Our children love sport and both Beatrice and Michael swim for the school team; Michael also plays rugby. Everyone is made to feel like an individual and encouraged to be themselves. We feel that this is key in today’s fast moving world. The design and technology facilities in the school are incredible – so futuristic! We love how the children are encouraged to use technology in everyday learning. The Junior School offers English Speaking Board assessments that give the children invaluable experience in speaking in front of others. The PTA is also very active and organises great events which support the whole community. “I recently arrived in Singapore and I’m teaching Mathematics and Sciences for Grades 1 to 6 at The Explore School House. Parents send their children to a school to prepare them for the real world, yet all day long they do nothing but follow instructions. The modern world values people who are creative, able to communicate their ideas and collaborate. The Explore School House provides an environment that allows students to develop their creativity, critical thinking and communication skill sets. Keeping in mind that everyone learns in different ways, at various paces and possess individual interests, the school puts the children first and personalises education according to each child’s aptitudes and abilities. My favourite programme is project time. To nurture each child’s passions and interests, we dedicate time twice a week for students to work on projects of their choice. I’m often blown away with their creativity! We also set aside a day each week for field trips and guest speakers. To encourage the children to take ownership of their learning journey, we encourage them to suggest where to go for the trips and who to invite to speak. I’ve learnt a lot myself from these sessions. I love showing kids how much fun it is to learn and I hope that I inspire my students to find their passion. “We’ve been living in Singapore for six years as a family and 11 additional years for Kaiesh while he was at UWCSEA. Both children have been attending the school since K1. We believe in the UWC mission, values and education model. While UWCSEA has expanded tremendously from Kaiesh’s time, adding new structures, facilities, departments and a new campus, it’s still very committed to world-class education. We’ve had a great experience with the Infant and Junior school teachers so far. What we like most is the conceptual learning, which emphasises problemsolving and critical-thinking skills. We believe these skills, along with empathy and compassion, will help our children become confident young adults. It’s great that the school also incorporates physical and social education, along with art, through a range of programmes and activities. Both our children learn Mandarin and are engaged in activities like coding, yoga, mindfulness, Chinese painting and gymnastics. UWCSEA is one of the few schools that I know of where it’s “cool to be smart”. Students are competitive and collaborative at the same time. Before our daughter finished her first year at UWCSEA, we noticed a significant difference in her confidence, learning and approach towards people and the environment around her. The warmth we experienced as being part of the UWCSEA parent community is incredible. Which schools are near you?